Hi. I’m Carol. I’m a SAHM with three lovely boys aged 17, 15 and 10. Married to my best friend for 18 years, I am truly blessed. Have been living in the UK now for 6 and a half years, originally from South Africa. I began my card journey in October 2009 and am so addicted now that I wonder what I ever did with my time before this. My biggest luv is colouring with my Copics. Its’s crazy, there just never seems to be enough hours in the day to craft lol ! I am so honoured to be a Guest Designer for The Paper Nest Dolls. 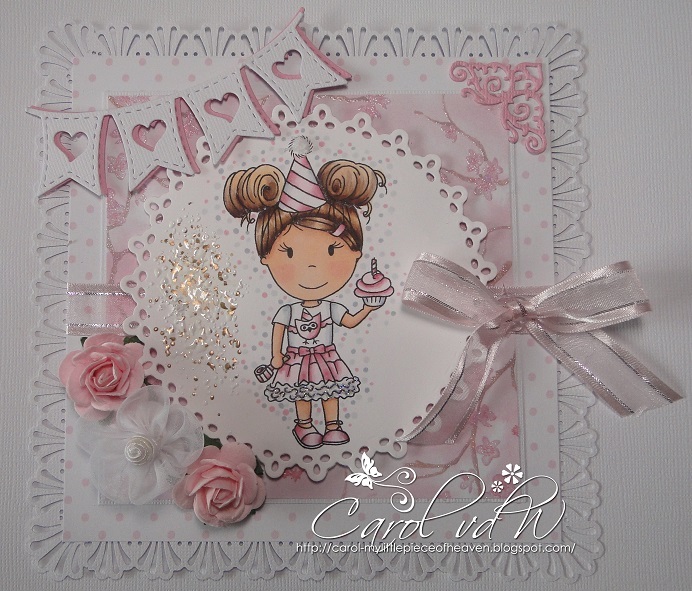 For my card I have used the adorable Birthday Emma, which can be found in the store here. Love your beautiful card. Love the pink and those pretty flowers. TFS.